Mikhail Nekhemyevich Tal (Latvian: Mihails Tāls; Russian: Михаил Нехемьевич Таль, Mikhail Nekhem'evich Tal, pronounced [mʲɪxɐˈiɫ nʲɪˈxʲemʲɪvʲɪtɕ ˈtalʲ]; sometimes transliterated Mihails Tals or Mihail Tal; 9 November 1936 – 28 June 1992) was a Soviet chess Grandmaster and the eighth World Chess Champion (from 1960 to 1961). Tal was born in Riga, Republic of Latvia, into a Jewish family. According to his friend Gennadi Sosonko, his true father was a family friend identified only as "Uncle Robert"; however, this was vehemently denied by Tal's third wife Angelina. From the very beginning of his life, Tal suffered from ill health. He learned to read at the age of three, and was allowed to start university studies while only fifteen. At the age of eight, he learned to play chess while watching his father, a doctor and medical researcher. Shortly thereafter Tal joined the Riga Palace of Young Pioneers chess club. His play was not exceptional at first, but he worked hard to improve. Alexander Koblents began tutoring him in 1949, after which Tal's game rapidly improved, and by 1951 he had qualified for the Latvian Championship. In the 1952 Latvian Championship, Tal finished ahead of his trainer. Tal won his first Latvian title in 1953, and was awarded the title of Candidate Master. He became a Soviet Master in 1954 by defeating Vladimir Saigin in a qualifying match. That same year he also scored his first win over a Grandmaster when Yuri Averbakh lost on time in a drawn position. Tal graduated in Literature from the University of Latvia, writing a thesis on the satirical works of Ilf and Petrov, and taught school in Riga for a time in his early twenties. He was a member of the Daugava Sports Society, and represented Latvia in internal Soviet team competitions. In 1959 he married 19-year-old Salli Landau, an actress with the Riga Youth Theatre; they divorced in 1970. In 2003, Landau published a biography in Russia of her late ex-husband. Misha was so ill-equipped for living... When he travelled to a tournament, he couldn't even pack his own suitcase... He didn't even know how to turn on the gas for cooking. If I had a headache, and there happened to be no one home but him, he would fall into a panic: "How do I make a hot-water bottle?" And when I got behind the wheel of a car, he would look at me as though I were a visitor from another planet. Of course, if he had made some effort, he could have learned all of this. But it was all boring to him. He just didn't need to. A lot of people have said that if Tal had looked after his health, if he hadn't led such a dissolute life... and so forth. But with people like Tal, the idea of "if only" is just absurd. He wouldn't have been Tal then. Tal first qualified for the USSR Chess Championship final in 1956, finishing joint fifth, and became the youngest player to win it the following year, at the age of 20. He had not played in enough international tournaments to qualify for the title of Grandmaster, but FIDE decided at its 1957 Congress to waive the normal restrictions and award him the title because of his achievement in winning the Soviet Championship. At that time, the Soviet Union was dominant in world chess, and Tal had beaten several of the world's top players to win the tournament. Tal made three appearances for the USSR at Student Olympiads in 1956–1958, winning three team gold medals and three board gold medals. He won nineteen games, drew eight, and lost none, for 85.2 percent. He retained the Soviet Championship title in 1958 at Riga, and competed in the World Chess Championship for the first time. He won the 1958 Interzonal tournament at Portorož, then helped the Soviet Union win its fourth consecutive Chess Olympiad at Munich. Tal won a very strong tournament at Zürich, 1959. Following the Interzonal, the top players carried on to the Candidates' Tournament, Yugoslavia 1959. Tal showed superior form by winning with 20/28 points, ahead of Paul Keres with 18½, followed by Tigran Petrosian, Vasily Smyslov, the sixteen-year-old Bobby Fischer, Svetozar Gligorić, Friðrik Ólafsson, and Pal Benko. Tal's victory was attributed to his dominance over the lower half of the field; whilst scoring only one win and three losses versus Keres, he won all four individual games against Fischer, and took 3½ points out of 4 from each of Gligorić, Olafsson, and Benko. 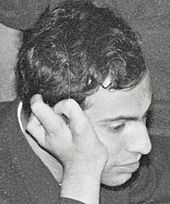 In 1960, at the age of 23, Tal thoroughly defeated the relatively staid and strategic Mikhail Botvinnik in a World Championship match, held in Moscow, by 12½–8½ (six wins, two losses, and thirteen draws), making him the youngest-ever World Champion (a record later broken by Garry Kasparov, who earned the title at 22). Botvinnik, who had never faced Tal before the title match began, won the return match against Tal in 1961, also held in Moscow, by 13–8 (ten wins to five, with six draws). In the period between the matches Botvinnik had thoroughly analyzed Tal's style, and turned most of the return match's games into slow wars of maneuver or endgames, rather than the complicated tactical melees which were Tal's happy hunting ground. Tal's chronic kidney problems contributed to his defeat, and his doctors in Riga advised that he should postpone the match for health reasons. Yuri Averbakh claimed that Botvinnik would agree to a postponement only if Tal was certified unfit by Moscow doctors, and that Tal then decided to play. His short reign atop the chess world made him one of the two so-called "winter kings" who interrupted Botvinnik's long reign from 1948 to 1963 (the other was Smyslov, world champion 1957–58). His highest Elo rating was 2705, achieved in 1980. His highest Historical Chessmetrics Rating was 2799, in September 1960. Soon after losing the rematch with Botvinnik, Tal won the 1961 Bled supertournament by one point over Fischer, despite losing their individual game, scoring 14½ from nineteen games (+11−1=7) with the world-class players Tigran Petrosian, Keres, Gligorić, Efim Geller, and Miguel Najdorf among the other participants. Tal played in a total of six Candidates' Tournaments and match cycles, though he never again earned the right to play for the world title. In 1962 at Curaçao, he had serious health problems, having undergone a major operation shortly before the tournament, and had to withdraw three-quarters of the way through, scoring just seven points (+3−10=8) from 21 games. He tied for first place at the 1964 Amsterdam Interzonal to advance to matches. Then in 1965, he lost the final match against Boris Spassky, after defeating Lajos Portisch and Bent Larsen in matches. Exempt from the 1967 Interzonal, he lost a 1968 semifinal match against Viktor Korchnoi, after defeating Gligoric. From July 1972 to April 1973, Tal played a record 86 consecutive games without a loss (47 wins and 39 draws). Between 23 October 1973 and 16 October 1974, he played 95 consecutive games without a loss (46 wins and 49 draws), shattering his previous record. These were the two longest unbeaten streaks in competitive chess for more than four decades , until Ding Liren broke the record in 2018 with 100 games, although with far fewer wins than either of Tal's streaks (29 wins, 71 draws). Tal remained a formidable opponent as he got older. He played Anatoly Karpov 22 times, 12 of them during the latter's reign as World Champion, with a record of +0−1=19 in classical games and +1−2=19 overall. One of Tal's greatest achievements during his later career was an equal first place with Karpov (whom he seconded in a number of tournaments and world championships) in the 1979 Montreal "Tournament of Stars", with an unbeaten score of (+6−0=12), the only undefeated player in the field, which also included Spassky, Portisch, Vlastimil Hort, Robert Hübner, Ljubomir Ljubojević, Lubomir Kavalek, Jan Timman and Larsen. Tal played in 21 Soviet Championships, winning it six times (1957, 1958, 1967, 1972, 1974, 1978). He was also a five-time winner of the International Chess Tournament in Tallinn, Estonia, with victories in 1971, 1973, 1977, 1981, and 1983. Tal also had successes in blitz chess; in 1970, he took second place to Fischer, who scored 19/22, in a blitz tournament at Herceg Novi, Yugoslavia, ahead of Korchnoi, Petrosian and Smyslov. In 1988, at the age of 51, he won the second official World Blitz Championship (the first was won by Kasparov the previous year in Brussels) at Saint John, ahead of such players as Kasparov, the reigning world champion, and ex-champion Anatoly Karpov. In the final, he defeated Rafael Vaganian by 3½–½. On 28 May 1992, at the Moscow blitz tournament (which he left the hospital to play), he defeated Kasparov. He died one month later. In Olympiad play, Mikhail Tal was a member of eight Soviet teams, each of which won team gold medals (1958, 1960, 1962, 1966, 1972, 1974, 1980, and 1982), won 65 games, drew 34, and lost only two games (81.2 percent). This percentage makes him the player with the best score among those participating in at least four Olympiads. Individually, Tal won seven Olympiad board medals, including five gold (1958, 1962, 1966, 1972, 1974), and two silver (1960, 1982). From 1950 (when he won the Latvian junior championship) to 1991, Tal won or tied for first in 68 tournaments (see table below). During his 41-year career he played about 2,700 tournament or match games, winning over 65% of them. Only official tournament or match games have been taken into account. '+' corresponds to Tal's wins, '−' to his losses and '=' to draws. Winning records in bold. Naturally artistic, witty and impulsive, Tal led a bohemian life of chess playing, heavy drinking and chain smoking. His already fragile health suffered as a result, and he spent a great deal of time in the hospital, including an operation to remove a kidney in 1969. He was also briefly addicted to morphine, prescribed due to intense pain. On 28 June 1992, Tal died in a Moscow hospital, officially of a haemorrhage in the esophagus. But his friend and fellow Soviet grandmaster Genna Sosonko reported that "in reality, all his organs had stopped functioning." Tal had the congenital deformity of ectrodactyly in his right hand (visible in some photographs). Despite this, he was a skilled piano player. Tal loved the game in itself and considered that "chess, first of all, is art." He was known to play numerous blitz games against unknown or relatively weak players purely for the joy of playing. Although his playing style at first was scorned by ex-world champion Vasily Smyslov as nothing more than "tricks", Tal convincingly beat many notable grandmasters with his trademark aggression. Prevailing against Tal's attack required extraordinary ability. It is also notable that he adopted a more sedate and positional style in his later years; for many chess lovers, the apex of Tal's style corresponds with the period (approximately from 1971 to 1979) when he was able to integrate the solidity of classical chess with the imagination of his youth. Of the current top-level players, the Latvian Alexei Shirov has been most often compared to Tal. In fact, he studied with Tal as a youth. Many other Latvian grandmasters and masters, for instance Alexander Shabalov and Alvis Vitolins, have played in a similar vein, causing some to speak of a "Latvian School of Chess". Tal contributed little to opening theory, despite a deep knowledge of most systems, the Sicilian and the Ruy Lopez in particular. But his aggressive use of the Modern Benoni, particularly in his early years, led to a complete re-evaluation of this variation. A variation of the Nimzo-Indian Defence bears his name. Tal vs. Alexander Tolush, USSR Championship, Moscow 1957, King's Indian Defence, Sämisch Variation (E81), 1–0. In a critical last-round game, Tal spares no fireworks as he scores the win that clinches his first Soviet title. Boris Spassky vs. Tal, USSR Championship, Riga 1958, Nimzo-Indian Defence, Sämisch Variation (E26), 0–1. Spassky plays for a win to avoid a playoff for an Interzonal berth, but Tal hangs on by his fingernails before turning the tables in a complex endgame; with the win, he captures his second straight Soviet title. Tal vs. Vasily Smyslov, Yugoslavia Candidates' Tournament 1959, Caro–Kann Defence (B10), 1–0. A daring piece sacrifice to win a brilliancy prize. Robert James Fischer vs. Tal, Belgrade, Candidates' Tournament 1959, Sicilian Defence, Fischer–Sozin Attack (B87), 0–1. Their games from this period are full of interesting tactics. Mikhail Botvinnik vs. Tal, World Championship Match, Moscow 1960, 6th game, King's Indian Defence, Fianchetto Variation, Classical Main line (E69), 0–1. An excellent sample of Tal's style from the first Botvinnik–Tal match. Tal sacrifices a knight for the attack and Botvinnik is unable to find a good defence in the given time; his 25th move is a mistake that spoils his game. István Bilek vs. Tal, Moscow 1967, King's Indian Attack, Spassky Variation (A05), 0–1. A risky counterattack is crowned with success, winning a brilliancy prize. Boris Spassky vs. Tal, Tallinn tt 1973, Nimzo-Indian Defence, Leningrad Variation (E30), 0–1. A game fuelled with tactics from its first moves. Black attacks in the centre and then starts a king chase. Tal vs. Tigran Petrosian, 8th Soviet Team Cup, Moscow 1974, rd 5, Pirc Defence, Classical System, (B08), 1–0. Tal destroys perhaps the greatest defensive player of all time in a miniature. Tal was a prolific and highly respected chess writer, penning a number of books, and serving as editor of the Latvian chess magazine Šahs ("Chess") from 1960 to 1970. His books are renowned for the detailed narrative of his thinking during the games. American Grandmaster Andrew Soltis reviewed his book on the world championship match as "simply the best book written about a world championship match by a contestant. That shouldn't be a surprise because Tal was the finest writer to become world champion." New Zealand Grandmaster Murray Chandler wrote in the introduction to the 1997 reissued algebraic edition of The Life and Games of Mikhail Tal that the book was possibly the best chess book ever written. Tal: Yes. For example, I will never forget my game with GM Vasiukov on a USSR Championship. We reached a very complicated position where I was intending to sacrifice a knight. The sacrifice was not obvious; there was a large number of possible variations; but when I began to study hard and work through them, I found to my horror that nothing would come of it. Ideas piled up one after another. I would transport a subtle reply by my opponent, which worked in one case, to another situation where it would naturally prove to be quite useless. As a result my head became filled with a completely chaotic pile of all sorts of moves, and the infamous "tree of variations", from which the chess trainers recommend that you cut off the small branches, in this case spread with unbelievable rapidity. And then suddenly, for some reason, I remembered the classic couplet by Korney Ivanović Chukovsky: "Oh, what a difficult job it was. To drag out of the marsh the hippopotamus". I do not know from what associations the hippopotamus got into the chess board, but although the spectators were convinced that I was continuing to study the position, I, despite my humanitarian education, was trying at this time to work out: just how WOULD you drag a hippopotamus out of the marsh? I remember how jacks figured in my thoughts, as well as levers, helicopters, and even a rope ladder. After a lengthy consideration I admitted defeat as an engineer, and thought spitefully to myself: "Well, just let it drown!" And suddenly the hippopotamus disappeared. Went right off the chessboard just as he had come on ... of his own accord! And straightaway the position did not appear to be so complicated. Now I somehow realized that it was not possible to calculate all the variations, and that the knight sacrifice was, by its very nature, purely intuitive. And since it promised an interesting game, I could not refrain from making it. And the following day, it was with pleasure that I read in the paper how Mikhail Tal, after carefully thinking over the position for 40 minutes, made an accurately calculated piece sacrifice. —  Mikhail Tal, The Life and Games of Mikhail Tal. Tal, Mikhail (2001) . Tal–Botvinnik, 1960. Russell Enterprises. ISBN 1-888690-08-9. Tal, Mikhail (1973). World Championship: Petrosian vs. Spassky 1966. Chess Digest. Tal, Mikhail (2003) . "Mikhail Tal, The Score Isn't Everything, Victory in the Ending". In Keene, Raymond. Learn from the Grandmasters. Batsford. pp. 5–16. ISBN 0713481382. Tal, Mikhail (1997) . The Life and Games of Mikhail Tal. Everyman Chess. ISBN 1-85744-202-4. Tal, Mikhail & Alexander Koblencs (2013) . Study Chess with Tal. Batsford. ISBN 1849941092. Tal, Mikhail & Viktor Khenkin (1979). Tal's Winning Chess Combinations: The Secrets of Winning Chess Combinations Described and Explained by the Russian Grandmaster Mikhail Tal. Simon and Schuster. ISBN 0671242628. Tal, Mikhail & E.B. Edmondson (1981). Chess Scandals: The 1978 World Chess Championship. Pergamon Press. ISBN 008024145X. Tal, Mikhail (1988). "The chess calculator's confession". In Estrin, Yakov; Romanov, Isaac. The World Champions Teach Chess. A & C Black. pp. 102–112. ISBN 0713655968. ^ a b c Tal's gravestone has 27 June as the date of his death. All other sources consulted give 28 June, including Kasparov, Garry My Great Predecessors, part II, p. 382, and The Life and Games of Mikhail Tal, p. 6. ^ Burgess, Graham; Nunn, John; Emms, John (2004). The Mammoth Book of the World's Greatest Chess Games (2nd ed.). Carroll & Graf. ISBN 0-7867-1411-5. ^ Evans, Larry (1970). Modern Chess Brilliancies. Fireside. ISBN 0-671-22420-4. ^ "Official FIDE Ding, Liren (CHN) Individual Calculations full report". ^ a b Soltis, Andrew (2002) Chess Lists Second Edition, 2nd ed., McFarland & Company, Jefferson, North Carolina and London, pp. 43–44, ISBN 0786412968. ^ Clarke, Peter H. (1991). Mikhail Tal – Master of Sacrifice. B.T.Batsford Ltd. p. 4. ISBN 0-7134-6899-8. ^ a b c Tal, Mikhail. olimpbase. Retrieved on 24 October 2013. ^ Horowitz, Al (1973). "The World Chess Championship, A History". Macmillan: 188. LCCN 72080175. ^ "1959 Yugoslavia Candidates Tournament". mark-weeks.com. ^ McFadden, R.D. (29 June 1992). "Mikhail Tal, a Chess Grandmaster Known for His Daring, Dies at 55". New York Times. ^ Kingston, T. (2002). "Yuri Averbakh: An Interview with History – Part 2" (PDF). The Chess Cafe. ^ The Life and Games of Mikhail Tal, revised and updated edition, by Mikhail Tal, 1997, London, Everyman Chess. ^ James Eade. Chess for Dummies. For Dummies. ^ Kramnik, V. (2005). "Kramnik Interview: From Steinitz to Kasparov". Vladimir Kramnik. ^ "Mikhail Tal vs. Alexander Tolush, USSR Championship, Moscow 1957". Chessgames.com. ^ "Boris Spassky vs. Mikhail Tal, USSR Championship, Riga 1958". Chessgames.com. ^ "Mikhail Tal vs. Vasily Smyslov, Yugoslavia Candidates' Tournament 1959". Chessgames.com. ^ "Robert James Fischer vs. Mikhail Tal, Belgrade, Candidates' Tournament 1959". Chessgames.com. ^ "Mikhail Botvinnik vs. Mikhail Tal, World Championship Match, Moscow 1960". Chessgames.com. ^ "István Bilek vs. Mikhail Tal, Moscow 1967". Chessgames.com. ^ "Boris Spassky vs. Mikhail Tal, Tallinn 1973". Chessgames.com. ^ "Mikhail Tal vs. Tigran Petrosian, 8th Soviet Team Cup, Moscow 1974". Chessgames.com. Chernev, Irving (1995). Twelve Great Chess Players and Their Best Games. New York: Dover. pp. 76–91. ISBN 0-486-28674-6. Gallagher, Joe (2001). The Magic of Mikhail Tal. Everyman Chess. ISBN 1-85744-266-0. This covers Tal's career post 1975, and can therefore be seen as a sort of sequel to Tal's own autobiography and games collection, which covers his career up to that point. Kirillov, Valentin (2017). Team Tal: An Inside Story. Moscow: Elk and Ruby Publishing House. ISBN 5-950-04330-8. Landau, Sally (2019). Checkmate! The Love Story of Mikhail Tal and Sally Landau. Moscow: Elk and Ruby Publishing House. ISBN 5-604-17696-6. Tal, Mikhail (1997). The Life and Games of Mikhail Tal (2nd revised ed.). Everyman. ISBN 0-486-28674-6. Winter, Edward G., ed. (1981). World chess champions. Pergamon. ISBN 0-08-024094-1.